Consider yourself blessed if you get to explore Hawaii and all the excitement that comes with it, but take it from my time living there -- there’s too much fun out there to confine yourself to a single island. Here are the adventures and experiences I miss the most that you won’t find sticking close to the tourist mob. 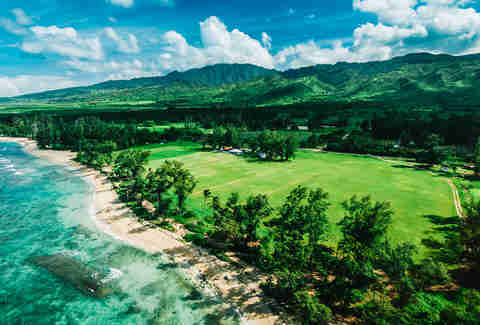 You’ll have to island-hop to enjoy them all but that helps you unearth more off-the-map fun -- Hawaiian Airlines serves eight airports in the area. Each flight is your opportunity to ask a new team of flight attendants for their favorite destinations. Here are mine. You don’t want to have the greatest vacation of your life on an empty stomach, do you? First stop: The Garden Isle. To break away from the tourist crowd, get your first meal at a food truck. Kalua pork, poke, huli-huli chicken, and fried Spam are just a few delicacies Hawaii is known for. And just like your resident flight attendants, chefs are well placed to hear about island happenings that are still news at the street level. What’s more, they offer views that sit-down restaurants would charge a mint for. If you’re in Kauai, don’t miss The Green Pig for their Porkaholic sandwich and piggy tail curly fries (loaded with more pork and smothered in gravy). Donkey Beach is right down the road, or even better, the gorgeous bike path. I admit it, I’m biased towards Oahu. But can you blame me? Most of the state lives here, so the island aptly named The Gathering Place has history, culture, arts, and food galore. Plan on a few extra days here before you move on to the other islands, is my advice, because you’ll just keep finding new reasons to stay. Having lived in Hawaii, I can attest to the value of learning about its heritage. Ask locals what they love (and what concerns them), and you’ll appreciate their culture of respect for one another and their land. More formally, you can visit Hawaii Plantation Village to get a first-person look into Hawaii’s history. 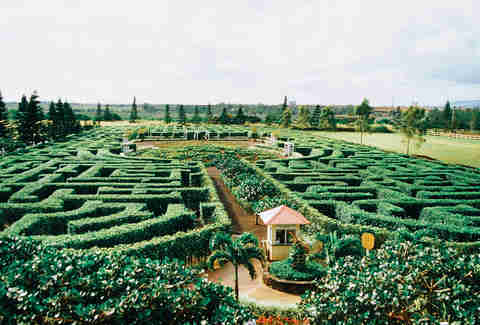 The world’s largest plant maze resides in Oahu -- and it’s both in the shape of a pineapple and made of actual pineapple plants. Yes, it’s located at the popular Dole Pineapple Plantation, but most people skip this unique aspect of the tour. It’s the safest way to get lost in a jungle. Take it from someone who used to live on the North Shore of Oahu, you can’t go wrong in the historical town of Haleiwa -- the food, the friendly people, the famous surf... the food again. Haleiwa is no secret, but it’s as much when you go as where: The surf capital of the world gets waaaay less touristy on weekdays, when traffic is manageable. Chill at Kono’s (original North Shore location for the street cred) for an iced vanilla macadamia nut coffee (and get the free refill). For breakfast in Honolulu, enjoy an açai bowl, a waffle, and a coffee at the unassuming Bogart's Cafe -- and don’t be afraid of fried rice for breakfast. It’s cash only, so come prepared. For an all-day breakfast option, you can’t go wrong at the “modest-sized” Over Easy in Kailua where you’ll fall in love with their fried egg sandwich (except on Mondays when they’re closed). If you’re into coffee and chocolate, don’t miss the Waialua Coffee Tour. 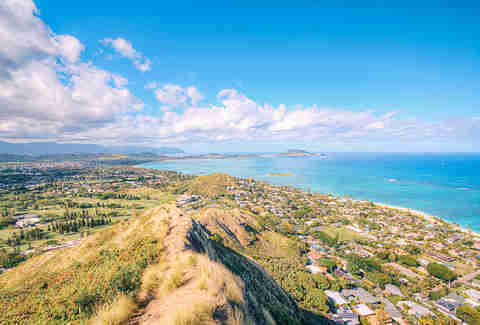 One of Oahu’s justifiably most-photographed beaches is Lanikai, but only connoisseurs know it’s the prelude to Kaiwa Ridge. Beyond the bend you’ll find Pillbox Hike, where some of the most majestic views on the entire island reside, including Kaneohe Bay and Waimanalo Bay. Look to the left of the golf course for a small dirt area, and you’ll see a tiny sign with a rope to help you climb the steep incline right at the start. As shade is lacking, go early or later in the afternoon and bring lots of water, then treat yourself to lunch (and an ice-cold cocktail) at Buzz’s after the hike -- you earned it! Don’t wait to do this -- the state plans to temporarily close the trail for maintenance soon. One of Oahu’s favorite activities is Polo Sundays at the Hawaii Polo Club, located in Mokuleia on the pristine North Shore. This is how Hawaii tailgates, so bring a cooler to watch exciting matches amid blue waters and lush mountains. There’s also a nearby ocean trail where you’ll have the beaches practically to yourself. The season starts in April and lasts through Labor Day. Okay, eventually, you have to relinquish Oahu. 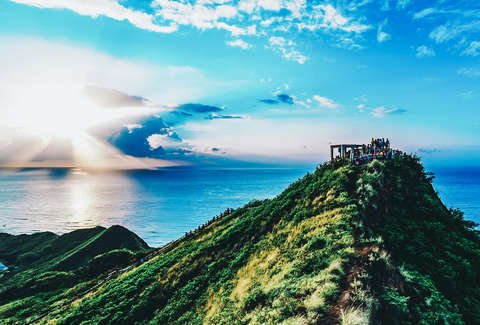 After all, you can’t miss Hawaii proper, because while we can debate the best island all day, the biggest has the advantage of so much to see and do. 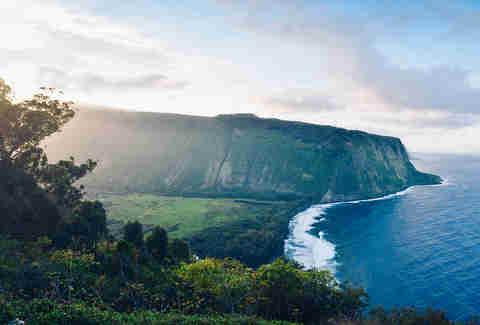 Escape the tourist scene at Waipio Valley Beach. 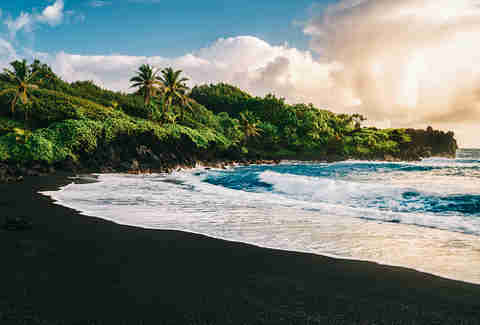 You’ll take 100 pictures trying to do justice to its unspoiled black sand and turquoise waters before giving up to live in the moment instead. Waipio makes you work for the good stuff -- it’s nearly a 3-mile hike, but you’ll see Kaluahine Falls as well as the larger Waiulili Falls, offset by 2,000-foot cliffs for ultimate tranquility. If all that polo horseplay has you raring to saddle up, get over to Ponoholo Ranch on Kohala Mountain in Waimea (Big Island) for a ride that stretches through three climate zones. You might even want to make a horseback ride a regular occurrence as you island-hop, because it’s a great way to see a lot more landscape than highway traffic will afford you. Ironwood Ranch in Napili (West Maui) offers both rides and eco-historical walking tours if you’re not enthused by our majestic horse friends. 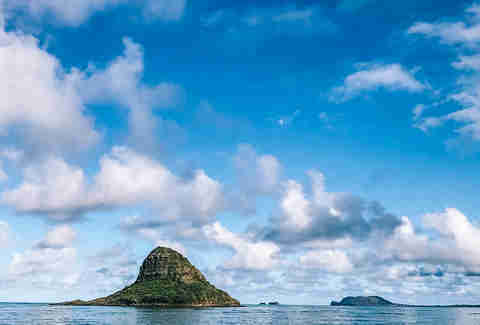 Both provide panoramic views of the islands -- including sunset tours. Dahana Ranch in Kamuela (also on the Big Island) doesn’t do rides at dusk, but is your place for free-range riding, including a cattle drive for groups of four or more. Amid all these hikes and beaches, there’s a standout beach that’s worth the required hike. 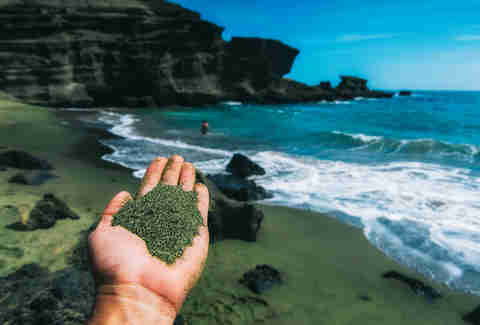 The Green Sand Beach in Papakolea sits at the base of Pu’u O Mahana, at Mahana Bay. This geologic anomaly demands you trade in your beach sandals for mountain boots, but the verdant shore rewards you. Respect the area and its geography -- don’t leave trash, don’t take any souvenirs, and enjoy being here. I know from personal experience you’ll be tempted to stay… and won’t regret it if you do. A guided snorkel is your best way to swim safely while respecting wildlife and still see some incredible, out of the way formations. Go with the pros at Big Island Divers, who will help you experience the vibrant life of the ocean the right way. Recommended: their night snorkel to observe manta rays and dolphins from a safe distance. And hey, it comes with hot chocolate! Since you’re already on the beach at night… Hawaii's absence of light pollution will change your entire life. Seriously. 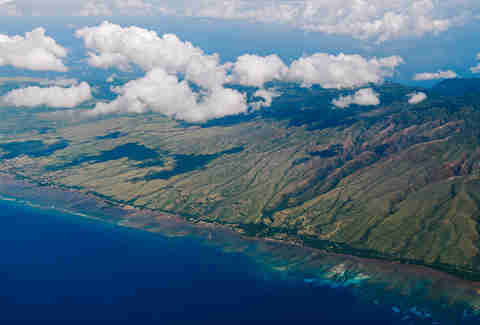 You’re on an island in the middle of the Pacific, you won’t find clear views and beauty like this anywhere else. Mauna Kea on the Big Island is where you’ll want to be and they even have a stargazing program on Tuesdays, Wednesdays, and Saturdays. Sign up early. Every island has its own personality, and the reward is in discovering the nuances differentiating each stop in your exploration. The Valley Isle has a lot of romantic charm, even by local standards. Couples, catch top-name musical acts at Nalu’s South Shore Grill, where the Hawaiian music scene’s distinctive sound reaches its perfect pitch, and don’t skip the apple brie burger. For a quieter dinner, dine on the roasted eggplant sandwich and lilikoi cheesecake at Colleen's at the Cannery. Both restaurants are a quick shot up the road to Milagros, where you’ll sip on li hing mui margaritas -- just $8.50 for the tastiest cocktail on the island. Will you end up strolling the beach by moonlight? Well, that’s up to you, but obviously. They call it The Garden of the Gods, but celebrities are a close second. Polihua Beach in Lanai is another great shore. This alluring, remote sandbar on the northwest of Lanai is only accessible via four-wheel drive. 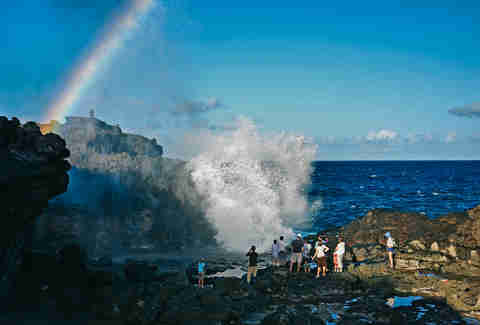 In fact, the entire island is difficult to access, making it popular among famous folks eluding paparazzi. Who knows? You could end up on a private patch of paradise with only your celebrity crush for company. Why ever come back? Jayme is a sports + travel + fitness writer based in Houston and writes the award-winning sports column The Blonde Side. Her work has appeared in ESPN, CBS, Women’s Health Magazine, Elite Daily, and a number of other publications. She dreams of the days she lived in Hawaii and is anxiously awaiting meeting with publishers to get her memoir on bookshelves and toilet seats any day.